So, we’ve come a long way to get here. But, we can assure you that the journey is worth it. We can now see beautiful noodles coming out. Finally, we can cut sheets of dough into noodle strands. 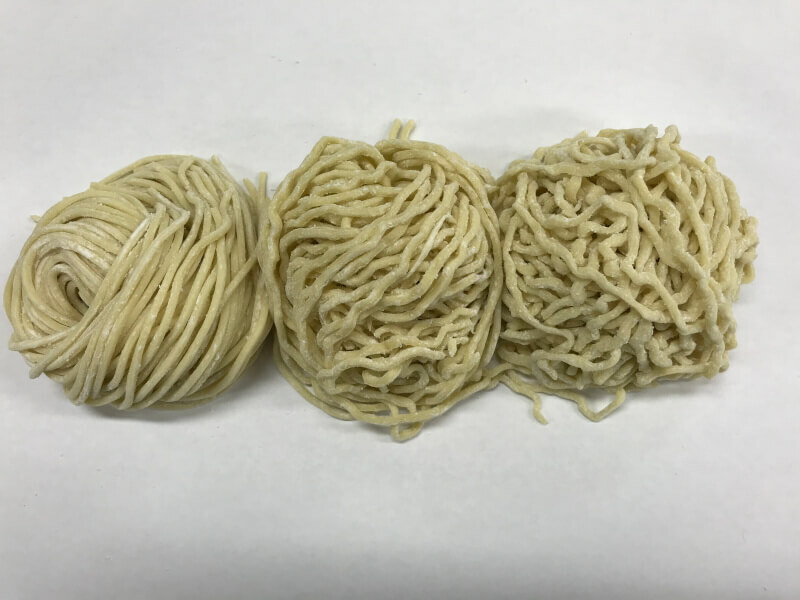 shapes and sizes of noodles, which also affect noodle textures. A good news is that we can make a variety of ramen noodles that are different in noodle shapes and sizes, which are made possible when cutting. These differences affect noodle textures. The type of noodle machine we use for production of ramen noodles uses slitter cutters, which come in different sizes and shapes. The slitter cutters are a set of rollers with many grooves, which cut dough sheet out to strands of noodles. (works like a paper shredding machine) Because these grooves (different width and shape) are fixed, we can cut only one size (width)/shape with a unit of slitter cutter. Depending on which cutter to choose to cut your noodles, finished noodles vary greatly, so selection of cutter is important. Now, we want to share some weird system that we have in sizes of slitter cutters. There is a standard numbering system for size (width) of slitter cutters. The size (width) is determined by a number/size. For example, if we have a cutter that is No. 20. This number means we can get 20 noodle strands out of 30mm-width of dough sheet. This number means “how many noodle strands we can get out of 30mm-width of dough sheet?” Then, the width of each noodle strand cut with a No. 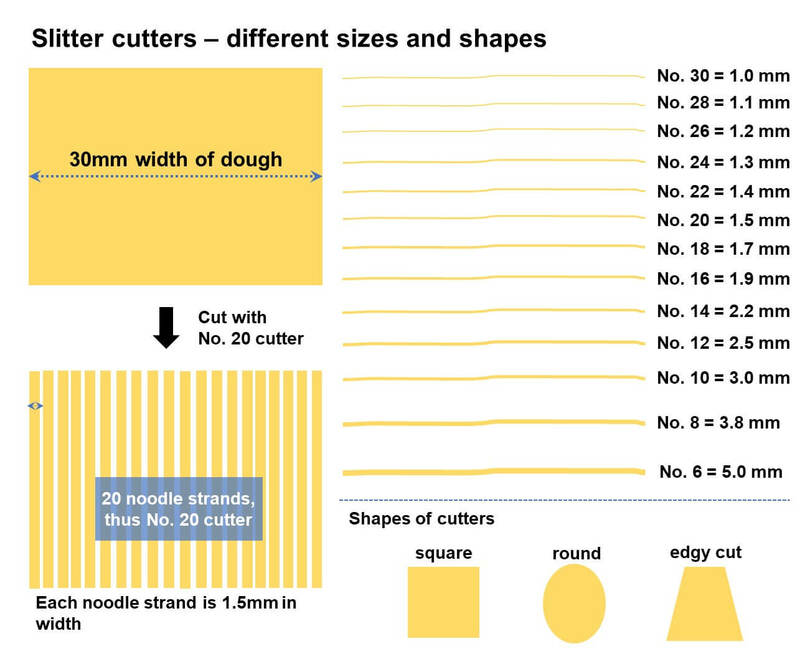 20 cutter is 1.5mm (30mm/20 noodle strands). 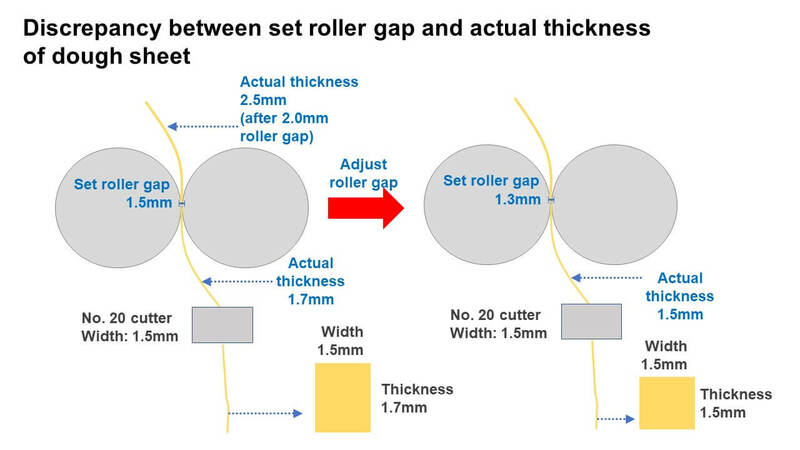 So, when you come across these slitter cutter sizes, you won’t be confused when choosing the size. In addition to the size, you can choose a different shape. The basic shapes available are square, round, and edgy cut. As the name suggests, when cut with a square blade, the noodle strands are squared. When cut with a round blade, noodles are round-shaped, and if you cut with an edgy cut blade, cut surfaces of the noodles are as sharp as if cut with a knife. It is important to choose a cutter for the noodle you’re aiming to make. We can also make other shapes of noodles. Flat noodles are one of them. When making regular ramen noodles, the shape is typically squared. For example, when we want to make 1.5mm squared noodles, we use a square No. 20 cutter and cut dough sheet as we thin it to 1.5 mm in thickness. We can make flat noodles by thinning dough sheet thinner than the cutter size (width), making the cut surface rectangular shape. So, we can thin dough sheet to 1.0mm and cut it with a square No. 20. 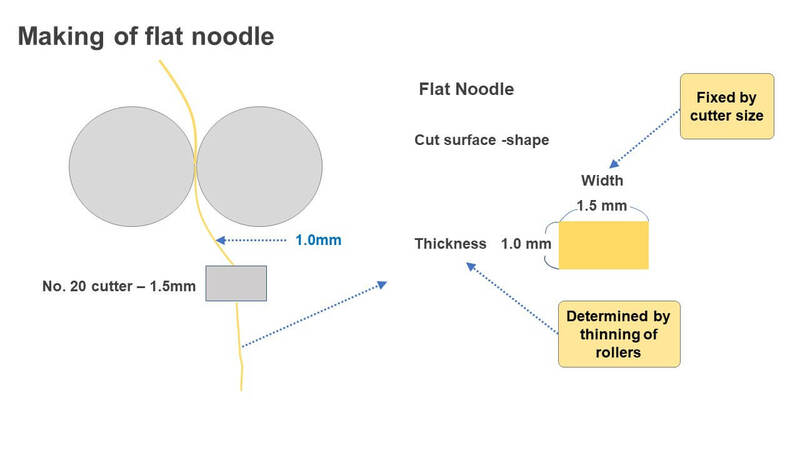 Then, the result is a noodle that’s 1.0mm in thickness and 1.5mm in width. And, have you heard of reverse-cut noodles? Or, gyaku-giri? Reverse-cut noodles are larger in thickness than width. (Because regular ramen noodles are bigger in width than thickness, this type of noodle is called, reverse-cut.) For example, we can cut dough sheet that’s 1.5mm in thickness with a square No. 30 cutter and make noodles that are 1.5mm in thickness and 1.0mm in width. Now, we have 2 types of noodles that are pretty much the same size. So, why would we care if they are flat or reverse-cut? This would make a big difference in noodle texture and texture-holding property of noodles (time it takes noodles to get soft in hot soup). Why? We can see why by carefully looking at noodle surfaces. The noodle surface that’s been pressured by the rollers is smooth and glossy. Tough this surface does not hold soup well, it does not absorb water, so the texture holds longer in hot soup. On the contrary, the noodle surface that’s been cut by slitter is rough, and it is not as smooth as the surface that’s been thinned by the rollers. Because of this opposite property, this surface absorbs soup and thus gets soft fast in hot soup. 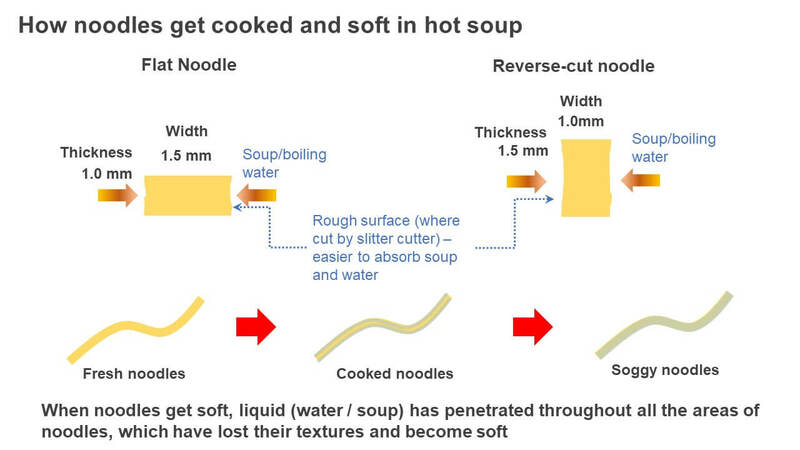 For this reason, these noodles are of the same sizes but different in noodle texture and soup absorption rates. When cutting noodles, we need to be careful about the final thickness. 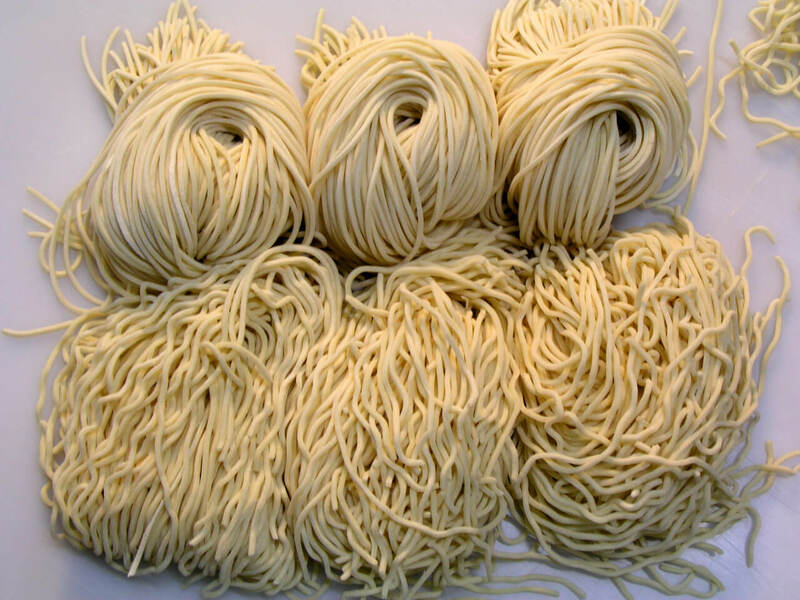 Because of the bounciness of noodles, thickness may spring back after noodles are thinned and cut. 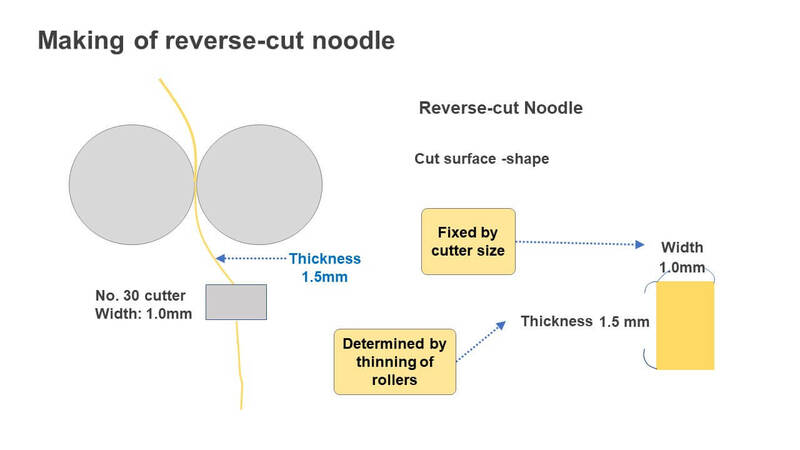 For example, if we think we thin and cut noodles at 1.5mm in thickness, the thickness may bounce back and be 1.6-1.7mm. So, we need to check the actual thickness of noodles and adjust the roller gap accordingly to have the right thickness. Why would you want to make your noodles straight or curly? Another element we need to be concerned with when determining ramen noodle texture is whether to make it straight or curly. Generally, most people think that curly noodles hold more soup, but it is actually the opposite. To see it, we need to picture straight noodles being lifted by chopsticks. 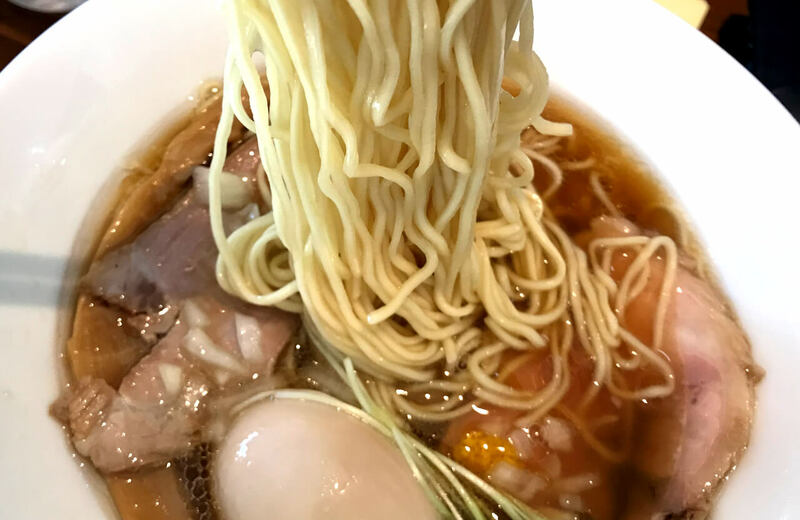 Because there’s little space between noodle strands when straight noodles are lifted from soup, straight noodles carry more soup between them. On the other hand, there’s some space between curly noodles, soup drips through these spaces. So, if you want your noodles to hold much soup, carrying a lot of soup at a time, you should choose straight over curly. But, when you want to have unique texture of curtly noodles, you should go for curly noodles over straight noodles. Okay. So, how can we make noodles curly? There are basically 2 ways. Either making noodles curly automatically or manually. If you want to do it automatically, we can put a rubber plates on the back of slitter cutter and cut dough sheet. We can make curly noodles that are evenly wavy and same size. If you picture instant noodles, the curly noodles made this way are similar. Another way is to squeeze portions of noodles by hand. By applying certain pressure, you can make curly noodles that are randomly wavy and different in size. So, though they are of the same curly noodles, whether to make them by manually or automatically by machine, the results are considerably different. So, we are very happy to finally have noodles, finished products. We’ve gone through all the processes to make complete and fresh noodles from scratch. But, to master ramen noodle making and serving of ramen noodles, we still have two more articles to go. They are 3rd resting process and cooking of noodles. In the meantime, if you have any questions, please feel free to contact me.